Have you ever felt like you're not connecting with your child as much as you would like? With the busy on-the-go lifestyles we all lead it’s far too easy to neglect the needs of connection with the people closest to us, our children. Children let you know they need you in all kinds of ways. It is easy to overlook that child who really doesn’t beg for attention or is content entertaining themselves. While your child may be easily entertained and isn’t screaming for attention, it’s still important to make sure time is made to really connect with your child. 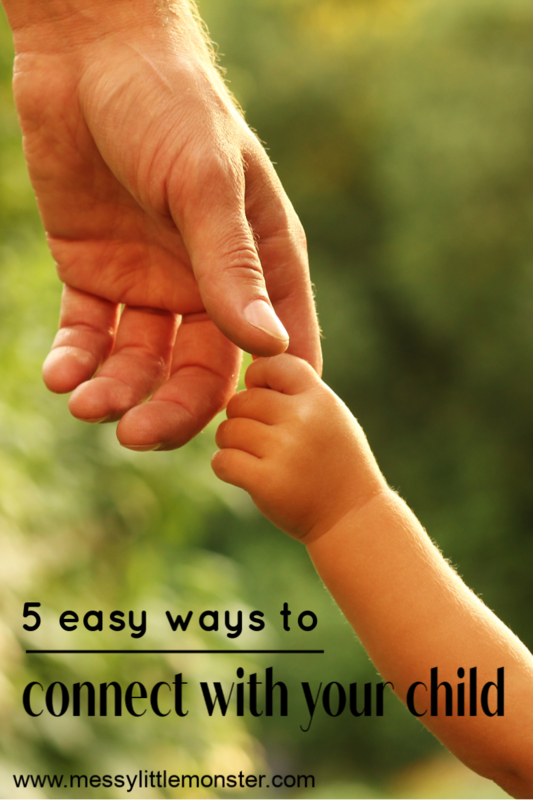 Here are 5 really easy ways to connect with your child. Some of these might seem obvious, but just taking a few minutes out to REALLY connect with your child makes all the difference. One on one quality time spent with your child means the world to them and it helps create a strong bond. Consider going on a walk and just listen to your child chit chat the whole time. Let your child take the lead, they might want to chat about the day, about general life or just enjoy your company. Enjoy spending time together without the distractions that get in the way at home. Maybe look at nature together or let your child take you on a mini adventure. Give your child 10 minutes each day where you really listen to them. Sit down together, put away and shut off any electronics and simply listen to your child talk about their day. This is a great way to connect with your child and learn more about their thoughts and life. A perfect time for this is just before bed when your child is ready to unwind from the day. Take this opportunity to tell them how proud you are of them, give them a hug and let them know you are always there for them. Often children feel connected to a parent who simply plays with them. It doesn’t have to be structured play, take half an hour or less to just simply play something with your child in the playroom or their bedroom. Let your child take the lead, they may like to play a board game, get you involved in pretend play or do a craft, or they might prefer you to tickle them and chase them around the house! Get in touch with your inner child and have fun and laugh together! Curl up on a comfortable chair or couch in your home to enjoy a good book together. This is great for children of all ages, but works best with younger children who can’t yet read. Have your child select a few of their favourite books and enjoy a relaxing storytime together. Talk about the stories and the pictures and enjoy cuddling into each other. As you read together it's the perfect time to get close, have a hug and tell your child how much you love them. Consider getting your child involved in the kitchen with you to cook up a meal or special dessert. If they are too young to follow instructions, give them a few safe ingredients and a bowl of their own to play with. This is a great way to connect with your child whilst also getting things done. Whilst cooking you will have plenty of time to talk and they will be really proud of the food that they have helped to cook. 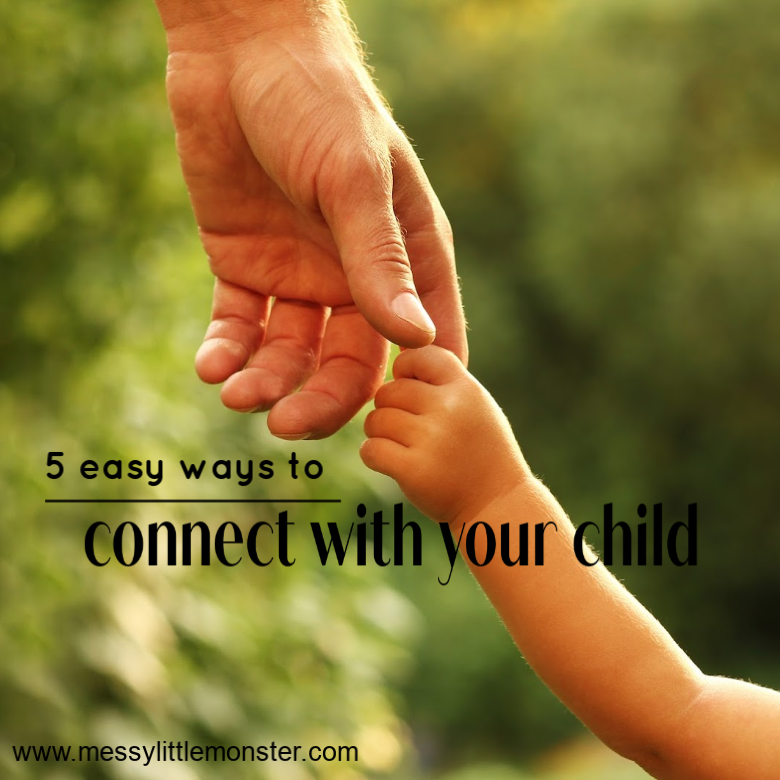 Connecting with your child is all about solidifying that bond between parent and child. Regardless of your busy lifestyle, there’s always a way to spend quality time where you can really connect. Spending uninterupted time together gives your child the opportunity to really open up and share their feelings and thoughts, it makes them feel safe and secure and helps create a strong bond.